The AQ-DM-4UBT Digital Media Locker� is a high quality, robust and durable waterproof marine grade stereo for use with Bluetooth, USB, iPhone, iPod, MP3 and FM radio. Simply insert your digital media device (iPhone, iPod, USB or MP3) into the locker, close the door and turn it on! Control your device via the external door controls or remotely using the fully waterproof, floating 2-way RF (Radio Frequency) remote control. The remote has a range of 40ft and displays song and track information on the LCD screen. The waterproof AQ-DM-4UBT features an onboard 288W amplifier capable of powering up to 8x speakers, or a combination of speakers and subwoofers, 2x high-quality RCA (phono) pre-outs for connecting an external amplifier (AQ-AD300.2) or powered subwoofer and a host of other features such as DSP EQ, 12V trigger and FM radio with 3x pre-set memory. 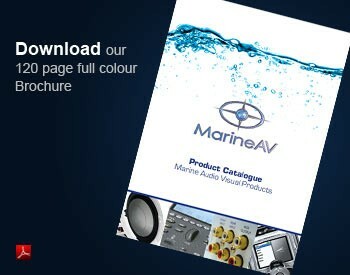 As with all Aquatic AV waterproof or marine stereos the AQ-DM-4UBT is designed and built to withstand the harsh conditions associated with use in marine, boat, pool and spa applications.